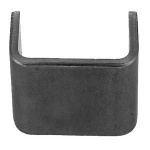 Straight Weld-On Stake Pocket is ideal for securing stake body wall assemblies on the straight-side of a stake body flatbed or trailer. Available in two lengths, stake pockets can be painted to custom match vehicle or stake body. 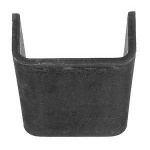 Buyers Products Straight Weld-On Stake Pocket is ideal for securing stake body wall assemblies on the straight-side of a stake body flatbed or trailer. The two piece stakes have welded reinforcements and are constructed from 14 Ga steel. Available in two lengths, stake pockets can be painted to custom match vehicle or stake body. Inside Dimension: 3-1/2" x 1-3/4"
Inside Dimension: 3-1/2" x 1-1/2"
Inside Dimension: 3-1/8" x 1-5/8"